Finding a garage you trust can be a nightmare. Often we hear about the mechanics turned mercenaries - the bad guys who charge more or don't repair what needs fixing. But what about the good guys - the commandos of their profession? There is a tough team of diverse mechanics in Maidenhead, who can service, check, fix, mend or replace every part of your vehicle including the engine, windscreens, tyres, bodywork and paint. 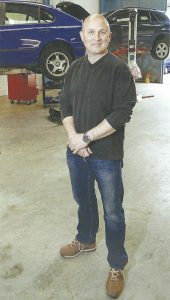 Working in Cordwallis Street, this special group revolve around the solid, honest reputation of Andy Thurgood aka Mr T.
Mr T's no-nonsense attitude is set to clear bad, dishonest work in his profession and supply customers with top car care and reliability. The reason is simple: Mr T Autos puts the driver in the seat of spending control. My mechanics won't do anything to the car until the customer knows what's wrong," assures Andy, adding: ”As much as I know about the fixing of cars, it’s always important to understand the driver too." We'll talk through the proposed work, in everyday language," says Andy, “and we'll agree the expenditure, and we show you the work we've done afterwards, to make sure you’re entirely satisfied." Andy's qualified team include: H - he's no maverick that H really does stand for ‘Helpful'. Ifyour car has had an unfortunate prang then the dynamic duo of Kevin ‘Cannibal Smith' and Mark Barking Mad' will have your car's bodywork looking as good as new. If you need the expertise of the team telephone: 01628 788880 or 07768 448823.